Alert Thingy is a Desktop app for friendfeed status updates. Alert Thingy is a Adobe Air app for friendfeed like Twhirl for twitter, which streams updates and allows you to post comments and messages to friendfeed. 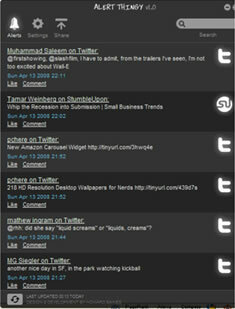 Till now i am not an active user of friendfeed but after installing Alert Thingy i am now following friendfeed streams. Desktop apps are very good to follow these type of conversations than web. It also integrates a search function which is quite useful. I really feel like they need to give us an option to customize the UI soon. The font is horrible and so are the colours. I hope Digsby will add-on support for this FriendFeed service too. Too many desktop apps is killing my Windows memory!